I am assuming for the purpose of this piece that the Green Party can be classified as a party to the Left of Labour, but clearly there is room for debate around this. 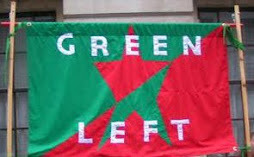 For ten years I was a member of the party and was one of the founder members of Green Left a group which tried to push the party in a left direction away from “lifestyle politics” and towards active anti capitalism. This effort succeeded to some extent but there was always resistance from some sections of the party and also from the leadership. The main bone of contention in 2011 with the introduction of austerity and the cuts by the Coalition government was whether Greens would implement those cuts in local government or refuse and join a Left coalition against them. This caused a massive debate at the 2011 Green Party conference and a few months later the Greens gained control of Brighton and started implementing cuts. At this point myself and a number of other Left Greens left the party. But all of this was in the context of a Labour Party that was still very much Blair and Brown’s New Labour. The Greens provided a space to the Left of Labour for the last 20 years. They were closely involved in the anti-war movement, the campaign for a written constitution and PR, supported Scottish independence before anyone else in England as well as their core agenda of saving the planet, opposing nuclear power and fracking etc. They tried desperately to build links with the trade unions through organisations such as the Trade Union Campaign Against Climate Change. and their biggest scalp was when a former President of the RMT joined their ranks. They also benefited from the move of Labour to the Right by capturing the imagination of the young, especially after the betrayal of the Lib Dems in the Coalition government after 2010. They experienced the Green Surge when a boom in membership occurred, many of them former Lib Dem and Labour members. on why he resigned. He describes the Greens as becoming the Brighton party and having the prospect of only having one MP in the near future. Others have called on the Greens to disband and form a sort of Momentum environmental movement in the Labour Party. One can immediately see the parallels with the situation which Left Unity has faced. Both are under pressure to shut up shop and join the great Corbynista movement. Some Left Greens now think that at the party conference in Harrogate in October the Greens will turn right and back to their core environmental and lifestyle politics, realising that there are no more votes to harvest on the Left and that their only hope is to gain disilussioned Tory and Lib Dem Remain voters. It is noticeable that Caroline Lucas and the Greens have been much more vocal in opposing Brexit and supporting Free Movement than Labour. Other Left Greens are looking at a realignment of Left politics in Britain outside the Labour Party and working more closely with Left Unity, the AGS etc. The question is, is that possible in the now barren landscape on the Left outside Labour? These are the sort of issues which Left Unity needs to be discussing with other movements on the Left outside of Labour as glorious isolation is not going to work for either the Greens, Left Unity or the AGS. Maybe the time has come for a new ecosocialist movement on the European model? Just to be sure what is the Green Left policy on the cuts, no if no buts no cuts or the Brighton cuts, is Caroline Lucas a member of the Green Left UK.... ! ?